Soon after the invention of the Linotype, the machine quickly spread around the world. Similarly, DVDs of our film have been sent all around the world, but due to arcane entertainment contracts, the film has only been available digitally in the United States, but now that has changed! 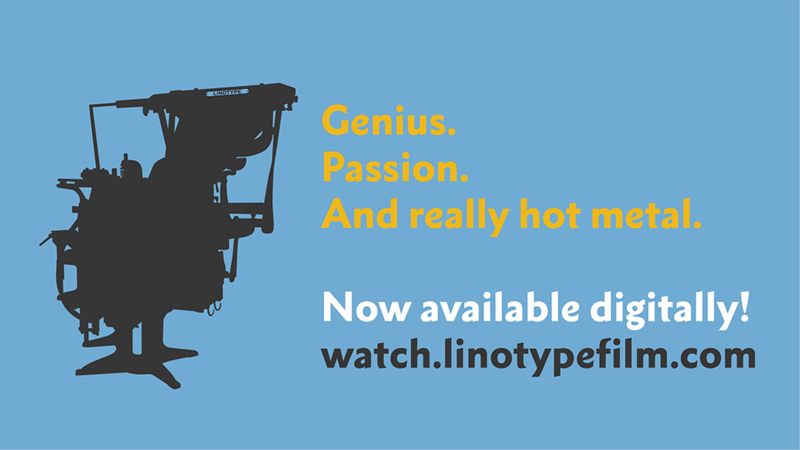 We are excited to announce that you can now purchase or rent the film digitally, in high-resolution, and DRM-free from watch.linotypefilm.com in any country in the world. Of course, you can still get the film via iTunes or Amazon as well. It is with much sadness that we announce the passing of Ray Des Champs at the age of 76. Ray was a delightful man with a passionate dedication to the Linotype. He volunteered at the Museum of Printing and helped keep their Linotypes in running order. We remember Ray for his Linotype jokes and this surprise rendition of "Oh, Shenandoah" that he sang for us at the end of our interview in 2011. 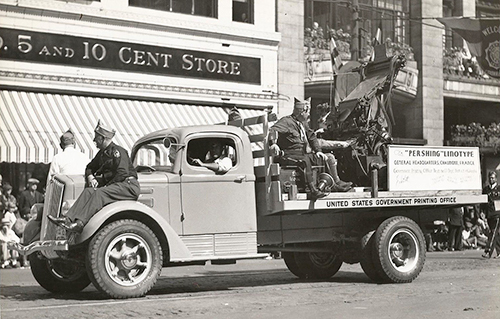 Government Printing Office historian and film participant George Barnum has written a great short story about GPO's "General Pershing" Linotype which was installed in the back of a truck during Pershing's American Expeditionary Force march through France in WWI. Thanks to George for sharing this and we are happy to learn about one Linotype from the GPO that did NOT end up in the scrap yard. It is with heavy hearts that we announce film participant and friend of the Linotype, Carl Schlesinger passed away on November 9, 2014 at the age of 88. Two obituaries have been published here and here. We spent two days interviewing Carl in his home in January of 2011. He and his wife could not have been more welcoming or excited that "some young boys" were interested in the Linotype. Without Carl, there would be no account of the change from hot-metal to digital type composition at The New York Times in 1978 nor would there be his fantastic song, poem, or tap dancing sharing his love of the Linotype. Carl, you will be dearly missed. Linotype Crew: Where Are They Now? 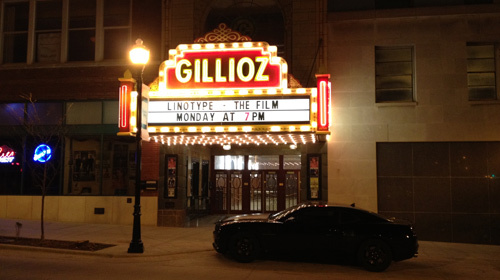 Have you wondered what the Linotype crew has been up to the last two years since the film release? Yes? Then watch the short video above. No? Then continue reading below. 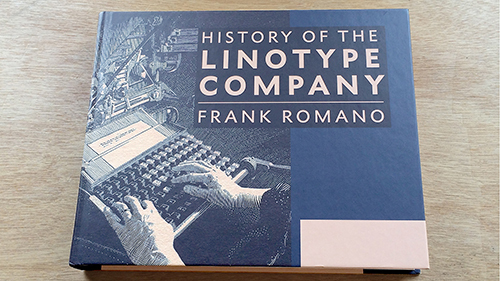 Since the film released, film participant Frank Romano has published his definitive history of the Linotype Company. Thankfully, you can now purchase the book from our web shop at a discounted rate. We sure wish it had been around when we were making the film! 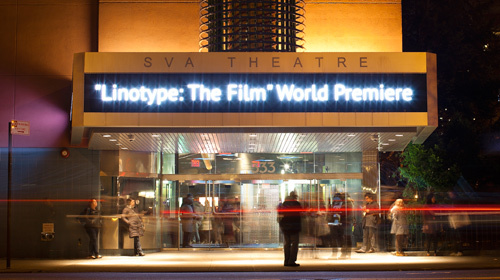 We continue to have screenings around the world and we love that people are still getting excited by the Linotype. Check out our screenings page for both future and past screenings. We are sad to announce that Guy Trower passed away on November 3rd at the age of 89. A Linotype operator for over 70 years, Guy was also a preacher and musician in Minnesota, Michigan, and Missouri. 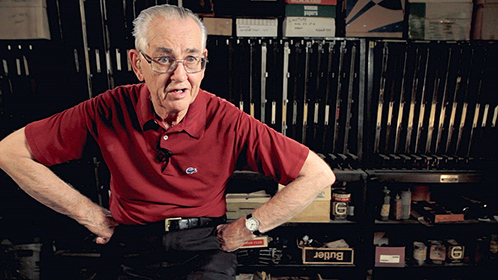 As our very first interview for the film, Guy showed that the love of the Linotype ran deeper than simply a machine. He passed on the love of the printing trade to his son, Tim Trower, who was our technical advisor and featured in the film. We are honored to have documented the last time that Guy used a Linotype as well as an outtake of Guy playing music on a Sears & Roebuck saw. We hope that Guy's legacy will continue to inspire a new interest in the Linotype and printing for years to come. Since the release of the film in October of 2012, we have had a wonderful response from so many people. Thank you to all that have purchased the film and told others about it. Our success is directly tied to your enthusiasm and love for the film. We continue to screen in locations around the world and are most happy when we get emails and letters from old Linotype operators. The typeface used in the film's graphics and titles use a custom-designed version of Metro by Toshi Omagari. 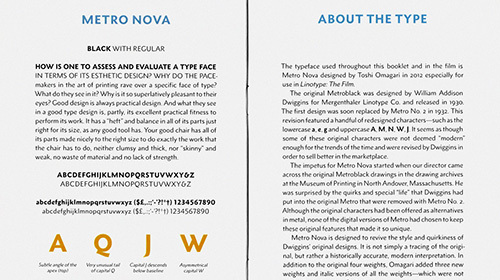 From this single-use, it has expanded into a full-fledged typeface called Metro Nova that was just released. This new typeface expands William Addison Dwiggins' original design and creates a larger family that can be used for all modern applications. Genius. Passion. And really hot metal. We are thrilled to announce that the film is now available to purchase worldwide. Buy your copy on DVD or Blu-ray from our web shop now! 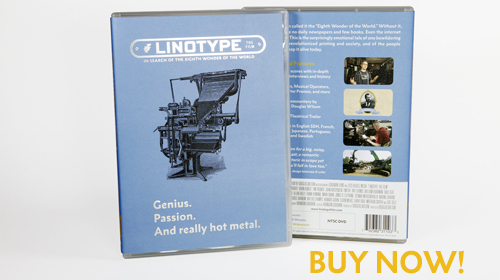 The DVD features a limited-edition foil-stamped cover and includes a 32-page booklet with two articles about the Linotype and making the film. It also includes over 70 minutes of bonus features including extended interviews, outtakes, and commentary. If you just can't wait for your DVD to arrive, you can also rent or purchase the film on iTunes or Amazon Instant Video. 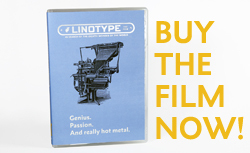 Just search "Linotype Film" and start watching the film immediately. Isn't the internet great? Please make sure to share the film release with all of your friends and family and help spread the word about this crazy machine that we fell in love with over the past two years. Official Release Date: October 16th! We are incredibly excited to announce the official release date of the film: October 16th. We will release it on DVD and Blu-ray from our shop and the film will be available digitally for rent and purchase on iTunes and Amazon Instant Video. 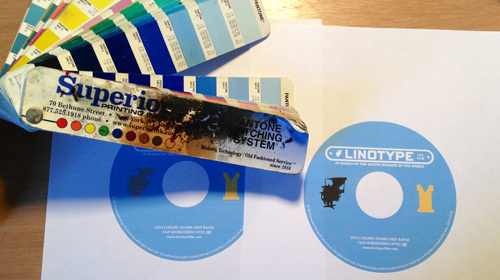 Above, you can see the sample disc design being matched for color. Along with the 76 minute film, the DVD and Blu-ray discs will include over 70 minutes of bonus features including extended interviews, outtakes and a director's commentary of the film. If you purchase the film digitally, and still want more, you can purchase the bonus features directly from our shop. We have worked very hard to have the film available in as many international iTunes stores as possible, so hopefully you will be able to download from your localized store on October 16th. We are also replicating NTSC DVDs that are region free. This means that you can watch the film no matter where you live in the world. Additionally, the DVD and Blu-ray discs will have subtitles in seven different languages: German, French, Spanish, Portuguese, Swedish, Japanese and English SDH (for hearing-impaired). 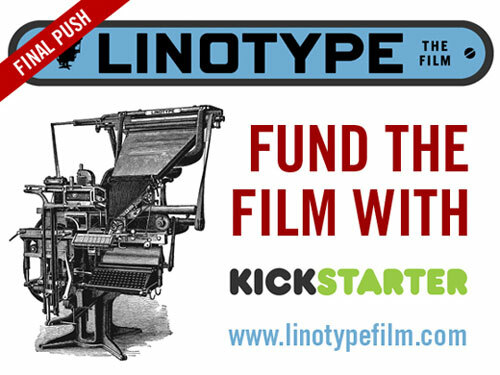 We hope that this will allow more people to fall in love with the Linotype story as we did. In the last few weeks, we have been working on sub titles for six foreign languages and the deaf & hard of hearing. We have also be finalizing the bonus features and they are going to be great! There are many steps in the process of making DVDs but things are moving forward rapidly. Every day we are getting closer and closer to the final release in mid-October - we appreciate your patience. We know that you are very excited to get your hands on a copy of the film. Although we do not yet have an exact date, we can officially announce that the film will be released in mid-October. We thank you all for your patience and promise it will be worth the wait! To help with the pain of waiting all summer, we have uploaded a few short clips from the film. Click on over to our clips page for your viewing pleasure. We are excited to announce that we have signed a digital distribution agreement. This means that, in addition to the DVD, we will release the film on many digital platforms such as iTunes, Netflix, Amazon, Hulu and many others. 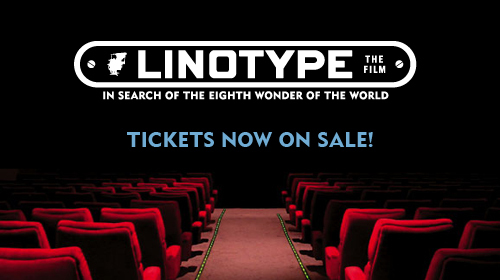 We see this as a very exciting development that will allow the film to be seen all over the world and for more people to learn about the Linotype. After our initial round of about a dozen screenings around the United States, we are very excited to announce 11 new screening dates including our first international screening in London, England on April 26th. If you live in or near Detroit, Champaign, IL, Minneapolis/St. Paul, New York City, Springfield, MO, Portland, ME, Lancaster, PA, London, England, Baltimore, MD, San Francisco or Brighton, England - get more info and your tickets on our screenings page. It has been a busy few weeks since the world premiere of the film in New York City! The film has screened in six different cities to sold out crowds and an enthusiastic response. The world premiere at the SVA Theatre went fantastically well. There were 400 people in attendance and the Q&A moderated by Steven Heller was great. We had people travel from as far away as Ohio, Florida, and Missouri to see the film. The response to the film has been overwhelmingly positive and we are so excited that people are loving the film as much as we love it. Many people have been surprised at the funny and charming characters that make up our film and we couldn't be more proud. In the coming months, the film will be screened all over the world. Hopefully, it will come to a city near you. For those who live where the film will not screen, DVDs will be released in the early fall. After months of countless hours of editing, the final edit of the film is complete! We have sent the edit to be color corrected and the audio to be mastered. This final process will ensure that the film looks consistent and polished throughout. Our world premiere of the film is February 3rd at the SVA Theatre in New York City. 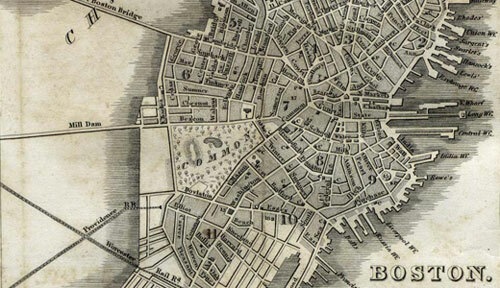 A few days later, the film will screen in Boston and other east coast cities. Tickets are on sale now on our screenings page and more will be added very soon. We have released our official trailer for the film! Visit our clips page to see it. We have added a resources page that will become a hub for Linotype information in the future. We also launched a new shop and to celebrate, you can use discount code "Mergenthaler" for 30% everything in the shop this week only. 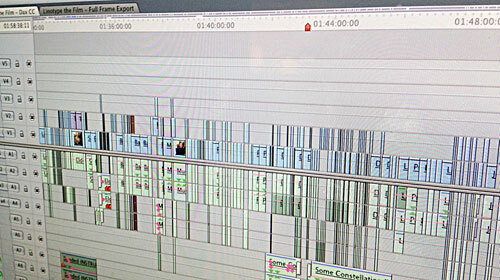 We apologize for the long delay between updates, but this can mean only one thing – we are busy editing the film! Slowly but surely we are bringing footage, music and graphics together to make the film. Editing is a long and difficult process similar to putting together a 1,000 piece puzzle without knowing what the final picture looks like. We are very excited to announce that the world premiere of the film will be February 3, 2012 in New York City. This will start a screening tour that will span across the United States and into other parts of the world. Additional screening dates and locations and will be announced soon. The photo above is a shot of what the film looks like in Final Cut Pro. It's is pretty boring looking at the moment, but we promise it will look great once we are finished! About a month ago, we were entrusted with a stack of original 16mm films from the Mergenthaler Linotype Company. These films were educational and sales films for the Linotype company and were given to us by someone we interviewed for the film. He had received the films from the person that had purchased all of the assets of the Linotype hot metal company when it went out of business. Through your generous help, we have successfully digitized all of the films to save for future generations. Above are a few screen shots of the films. We will be releasing more information about the films in the future. 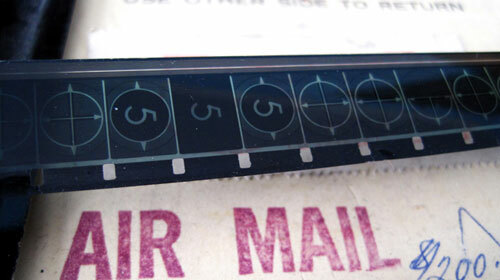 We have been given seven 16mm educational films from the Mergenthaler Linotype Company from the 1950s and '60s. 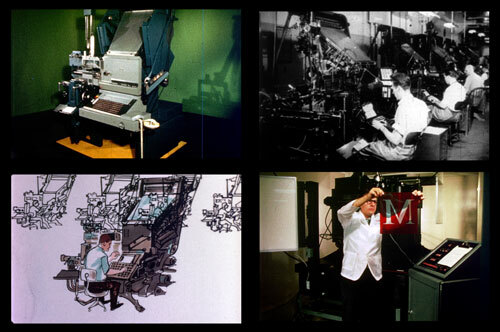 They are the original films that were sent out to educate people on how different aspects of the Linotype work. Our director has created a short video here. As far as we know, these are the only remaining films in the world and we want to help preserve them for the next generation. Any money received over our goal will help fund sending these to a telecine where they will be digitized. Please support our Kickstarter Project which has about 48 hours left. We are excited to announce a second Kickstarter project to help us cover post-production expenses. We need your help with the expenses of editing, color-correction, sound mixing, motion graphics, music acquisition and archival footage. With your help, we can deliver the highest quality production possible. Please click here to learn more about becoming involved with our project. 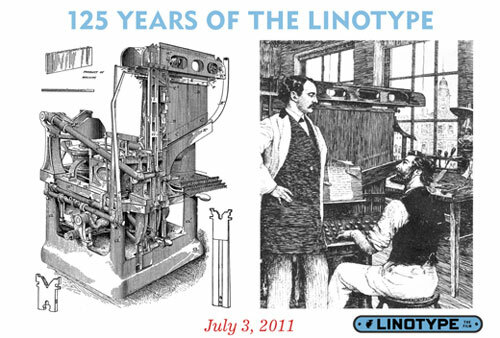 Today is a very special day – not only in the history of the Linotype, but also in the history of communication and technology. On this date in 1886, the German clockmaker, Ottmar Mergenthaler demonstrated the first Linotype Type Casting Machine at the New York Tribune in New York City, USA. In front of a gathering of printers, newspaper men and reporters, the machine was first put in to production, casting lines of printable type for the Tribune. At this demonstration, Mergenthaler sat at the machine and cast the first line of type. It is alleged that Whitelaw Reid, the owner of the Tribune, exclaimed "Ottmar! You've done it! A line of type!" A reporter asked what the new machine was called and Reid replied, "Why yes, we do have a name. We are going to call it the Linotype." This simple demonstration was the culmination of 10 years of extremely hard work by Mergenthaler. His genius and skills were put to the task of inventing a machine that would revolutionize the world. His Linotype sped up the production of printable type and singlehandedly caused the biggest revolution in printing and communication since Gutenberg. It can be said that the Linotype was the "Twitter of 1886″ for it sped up the spread of information at a dramatic rate. Without the Linotype, news and information moved slowly, but now, people could read the news within hours of the event. Due to the speed and low cost of printing, literacy dramatically increased as more and more books and newspapers were published. So let us always remember July 3rd, the genius inventor, Ottmar Mergenthaler and his fascinating machine that revolutionized the world. This has been an amazing six months of travel and extremely hard work to locate and film all of the different angles and stories for the film. Our excitement for the film has been matched by the people we have interviewed and we couldn't think of a better way to have it. Many have been asking about the timing of the film, so here is what we know: after we finish our filming today in Washington D.C., we have only one small shoot left and then we will wrap official production. We will spend the next four or five months editing the film before we release it in late 2011 – just in time to honor the 125th anniversary of the Linotype. As we wrap up principal photography, we start the next great and difficult part of this journey: post-production. This is where we will edit the hundreds of hours of footage into a coherent story and portrait of the Linotype and the people that love the machine. This will take many months and much time sitting in a dark room with a computer – not as glamourous as it sounds, trust us. Although we could probably continue filming indefinitely, we feel extremely confident that we have been thorough in the locations and people that we have filmed. From barns in Iowa to foreign countries, we have met amazing people and they have shared with us intimate stories of this crazy machine. Thanks so much for your interest in the film, it still excites us. Although we are still in production and filming, we are excited to announce the first public sneak peeks of the film. These events are the first opportunities for the public to see our new footage. Our director, Doug will be speaking at the Brand Perfect Tour in London, Hamburg and New York City in May and June. In addition to talking about technology's impact on typography, he will be showing an extended trailer with exclusive new footage and interviews. Doug will also be giving a presentation entitled "The Linotype and the Second Revolution in Printing" at TYPO Berlin in May. 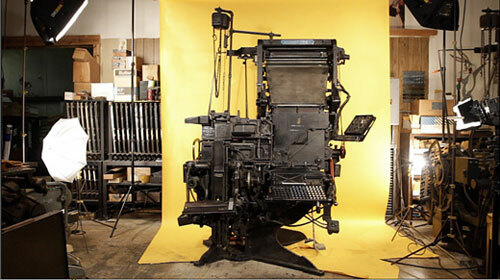 During the presentation, he will talk about the history and impact of the Linotype and show new footage. If you can make it out to any of these events, please make sure to say "hello" to Doug and give him a high-five to show your support. We've a busy next few months as we wrap up filming with trips to the midwest, Boston, Washington D.C. and Germany on the calendar. We are also starting rough editing of our footage next week. It is exciting to see everything coming together piece by piece. Although we will never be able to tell every single story related to the Linotype, we have collected some amazing footage that we can't wait to show you. People have come out of the woodwork to share about their lives with the Linotype. We are constantly encouraged by the support that we receive and we thank you for your interest in our little film. This week, we shot at Tim Trower's shop in Springfield, Missouri for some planned motion graphics sequences that will help explain how the machine works. We had to use a giant yellow backdrop (see above image) and move hundreds of pounds of lead to get just the right shot. Although the shoot was planned for five hours, it ended up taking closer to 11 – but we think it will be worth the extra effort. We are often asked when the final film will be finished, and although nothing is official, we are still planning for a late-fall release. As these dates get closer, we will start announcing the first screenings of the film. If you are interested in hosting a screening of the film, please visit the Screenings page for more information. As always, for the most up-to-date film news, follow us on Twitter. During the last few months, we have been traveling across the United States filming interviews and getting stories for the film. We have been getting great footage and we can't wait to share it with you. We will soon be filming in the Boston area and in April, we will be traveling again, so if you don't hear much from us it is because we are busy making the film. Please note that we have launched our Web Shop. If you have ever wondered what a line-o-type felt like or you have a bare wall that needs covering, please check out the shop. All proceeds go directly to fund the film, so this is a great way to support the film and get something fun in return.